I was a college on-air DJ for 4 years and have spent over 13 years in the Charlotte ballroom community. I have been a ballroom competition and party DJ for the past 8 years and you'll find me spinning the tunes at many local studios including USA Dance Queen City Chapter and UNCC Dancesport. With over 20,000 songs in a variety of genres, complete sound equipment, and experience with a variety of events including dances, competitions, private parties, fundraisers, weddings, corporate events, reunions, anniversaries, charity events, and more, I am ready to spin tunes almost anywhere. I have also been providing local dance information to the community free of charge since 1998. 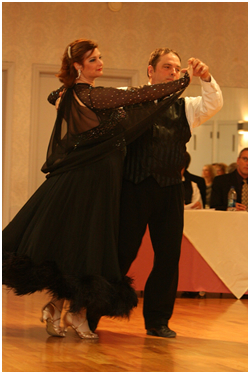 I list mainly Ballroom events, but you'll see something for everyone.